Some more free and fabulous fantasy books to help you get through the rest of this winter (for those of us in the Northern hemisphere at least). Click through to the giveaway to find something to take your mind off all this snow. In this week’s fun thing, I was featured as part of Pulp Literature’s Year of Authors. They’re celebrating their five-year anniversary, and I’m thrilled that I’ve had two stories published with them during that time. To celebrate, they’re also running sales on their magazine and books. So head on over for some deals. This week, I also finished up the formatting for the Coffee and Ghosts series bundle, which I’m calling The Complete Coffee and Ghosts. 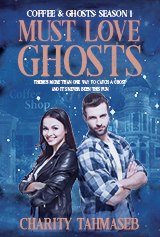 You know, for those who need all their ghosts (and coffee) in one place. The ebook is already up for pre-order and the paperback is making its way into various stores as well. That’s it for this week. Have a lovely Sunday filled with reading and writing. Another terrific giveaway courtesy of author Patty Jansen and Ebookaroo. If you’re looking for a new series, this giveaway is the place to start. Try out one, try out several. If you enjoyed the Fantasy Firsties giveaway from a few weeks back, you might really love the Fantasy Firsties Club, a weekly digest of first in series books in the Fantasy, Paranormal, and Supernatural Genres. You can sign up to get notifications about free and 99 cent books, along with books in Kindle Unlimited (handy if you have a subscription to that).